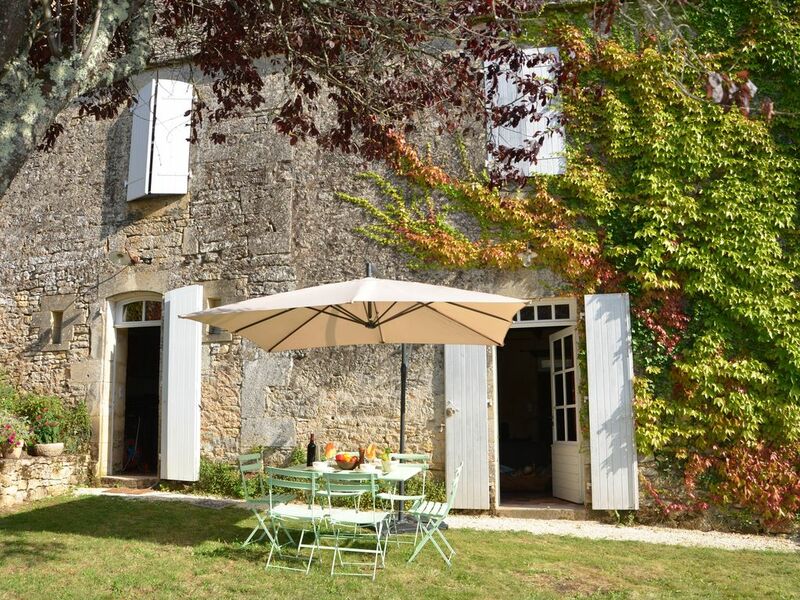 Ideally situated in the Dordogne, in the heart of the Valley of the four castles, the hamlet of Saint-Julien is a haven of tranquility, accessible by a dead end road. It overlooks the valley of the Dordogne, opposite the magnificent cliffs of Marqueyssac, the castle of Castelnaud-la-Chapelle and the listed village of Vitrac. At the entrance of the village, a 16th century house, in stone and with a slate roof, overlooking a garden on different levels. Its fully preserved traditional architecture, antiques and rare situation give this home a special charm. Completely renovated, the house, easily accommodating 6 people, has all the comfort, a large garden and a beautiful private pool. In any season, for an active holiday or pure relaxation will satisfy lovers of heritage and nature enthusiasts. The house, with an area of ​​200 m², has 3 spacious bedrooms with their respective bathrooms: the red room, the orange room and the honey room. The TV room, allowing access to the red room, with a comfortable sofa bed can be used to accommodate one or two children. The house also has a living room with a large open fire, a kitchen, 4 toilets and a cellar. A multi-level garden and a large private pool (6 x 12 m) located below the house allows to enjoy the remarkable views and absolute tranquility of the site. These levels can be hazardous for unruly children. Overlooking the garden, the views of the Dordogne valley and the cliffs of Marqueyssac are majestic in any season. Garden table with chairs, loungers and pool loungers are also available to fully enjoy the garden, the view, the tranquility. Wonderful time in a breathtaking view hidden gem! We just returned from our trip to la Dordogne and nothing can match the beautiful view we were blessed to contemplate every day while we were there! The house was all we had hoped for! Comfortable, clean, well-equipped and the spaciousness of the outdoors gave the kids and all of us much room to enjoy the sun, the sunsets and the unique breathtaking sight of the garden of Marqueyssac. The house is located close to everything one needs and yet, the peace and quiet felt as if we were in the middle of nowhere, which was what we wished for! Pierrette was a delight and so helpful all the way. Very responsive and truly eager to help make our stay the best one as possible. A definite recommendation for whomever wishes to explore le Perigord Noir and, without a doubt one that has helped us make many family memories! My family and I had a fantastic holiday here. The house is a great mixture of old and new and offered complete peace and quiet. I will not forget eating our evening meals in the garden, looking out over the lovely view and our days, lazing by the fabulous swimming pool. The house is also in a great location to see some of the beautiful towns and castles along this part of the Dordogne. We really enjoyed our visits to Domme, Beynac, Rocamadour, La Roque Gageac and Les Jardins de Marqueyssac. The only down side of the holiday was having to leave!! Das Haus ist sehr schön, die Lage sehr ruhig. Das große Grundstück ist in mehrere Terrassen aufgeteilt, auf denen man sich ungestört entspannen kann. Das große Schwimmbad lädt zum Baden ein. Man befindet sich im Zentrum interessanter Sehenswürdigkeiten und es gibt viele Möglichkeiten, Sport zu treiben. Le seul point négatif de notre séjour est une maison un peu humide par mauvais temps mais sinon nous avons passé (2adultes et un bébé) un superbe séjour au calme, en pleine nature, a nous ressoucrer. La maison est très belle, très bien entretenue (y compris la piscine). Tout est fait pour y rester: les lits sont très confortables et le service de table est très beau dans sa sobriété, pour une location ça fait beaucoup de bien de voir des gens qui ont du goût et qui ont mis à disposition des choses de qualité! Le village est charmant et la vue imprenable. Les propriétaires sont aimables et attentifs. At the heart of the Dordogne, the area offers a wide range of activities. For heritage lovers, within a ten km, the castle of Castelnaud-la-Chapelle, the castle of Beynac, Marqueyssac Gardens, Castle Milandes, the village of Vitrac, the country house Domme, the medieval town of Sarlat-la-Canéda. And a little further, the caves of Lascaux, Eyzies de Tayac, the cave of Rouffignac, the gardens of Eyrignac, the walled town of Monpazier. For sports, bike rides, walking (the house is located on the GR64), the descent of the Dordogne in canoeing, horseback riding, fishing, golf. For gastronomes, markets, local producers of foie gras, walnut oil, honey, etc. Also, flight over the area in a balloon, helicopter.